Activists outside of First Republic Bank's headquarters in San Francisco. Protesters picketed outside the downtown San Francisco headquarters of First Republic Bank this afternoon, alleging that the prominent financial company is fueling the city's displacement crisis by lending to real estate investors who evict tenants and eliminate rental housing. Using the Ellis Act, landlords who purchased buildings with loans from First Republic Bank have evicted tenants and sold the apartments as tenants-in-common homes (TICs) to affluent buyers. Tenants in common (TICs) have grown in popularity in San Francisco because they provide a loophole for investors and wealthier residents to circumvent the city’s strict rules regarding conversions of apartments into condos. An investor who has purchased an apartment building can evict all of the tenants and then sell the property, unit by unit, as TICs, taking advantage of a legal device that allows multiple people to own percentage shares of an undivided parcel — usually a building. (Unlike condominiums, TICs are not separate units mapped within a parcel. Rather, they are percentage shares in an undivided parcel.) TIC owners within a building sign a separate agreement to divide the property for their sole and exclusive use. Leticia Morales (center) and Martiza Osorio (right), residents of 300 Coleridge, are facing eviction after an investor bought their building with a loan from First Republic Bank. 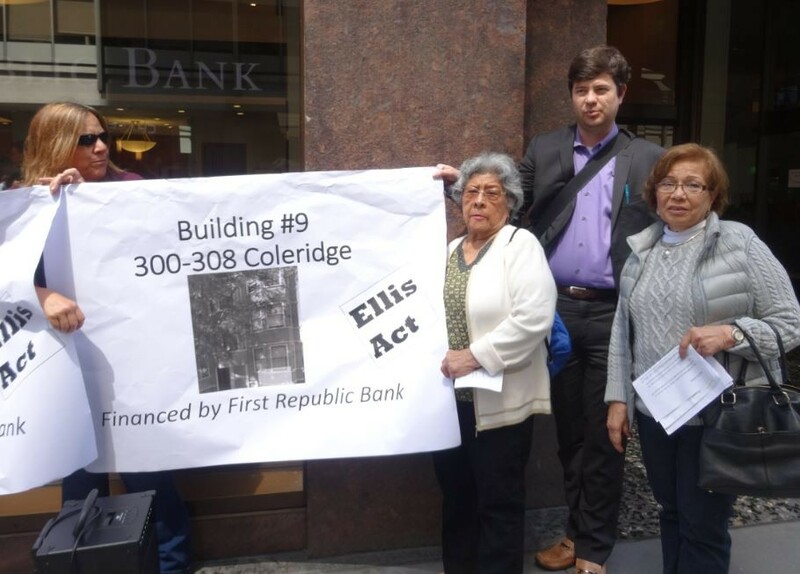 First Republic Bank is one of the largest TIC lenders in San Francisco, according to research conducted by Tenants Together and the Anti-Eviction Mapping Project. The groups say that investors couldn’t buy the properties and evict the tenants without First Republic Bank’s knowledge and assistance. Greg Berardi, a spokesperson for First Republic Bank, said that it was never the bank's intention to make loans to landlords who evicted tenants and converted their buildings into TICs. 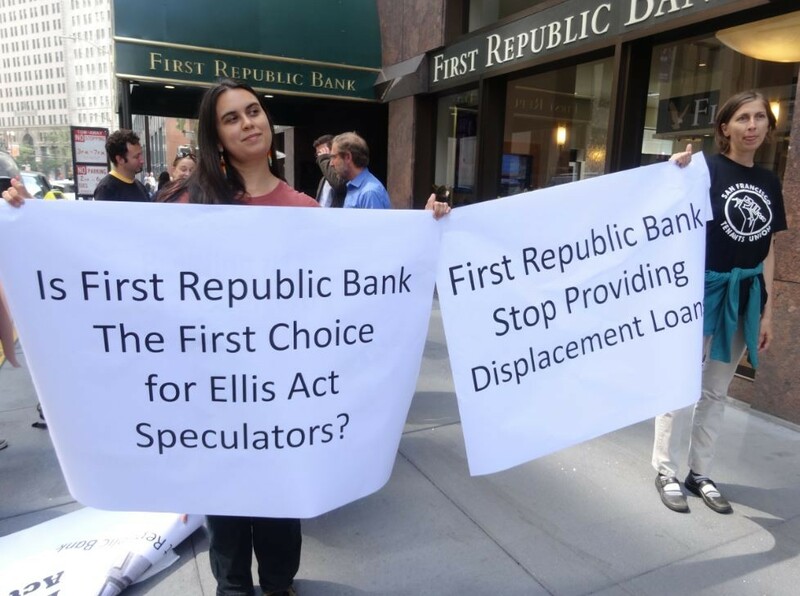 In a statement issued today, First Republic Bank said that it is changing its lending policies to prevent Ellis Act evictions. "If we are aware that the owner intends to utilize the Ellis Act before a loan is made, we will not make the loan," the statement reads. "On our loan applications, we will now ask each borrower whether the loan is intended to be used to repurpose the property under the Ellis Act." Berardi said, however, that of all Ellis Act-affected property in San Francisco, only a very small fraction — approximately two percent — had received loans from First Republic Bank. The Federal Deposit Insurance Corporation, which regulates First Republic Bank's compliance with federal financial laws, including the Community Reinvestment Act, gave the bank a "low satisfactory" rating with respect to its lending activities. Referring to First Republic Bank's focus on high-income and wealthy clients, the FDIC wrote, "the distribution of borrowers reflects poor penetration among retail customers of different income levels and business customers of different revenue sizes, given the product lines offered by the bank." 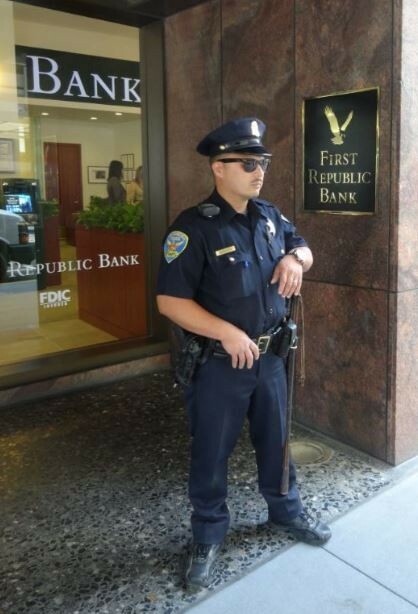 A San Francisco police officer guards the entrance of First Republic Bank's headquarters on Pine Street. First Republic Bank was founded in 1985 and specializes in banking services for wealthy clients. The bank counts Facebook CEO Mark Zuckerberg and Oakland’s elite, private Head-Royce School as clients, according to its website. In addition to financing TIC mortgages in expensive housing markets such as San Francisco, First Republic Bank has also financed several large investors who in recent years have bought up foreclosed single-family homes in the East Bay and converted them into rental properties. For example, first Republic Bank has lent millions to the Sullivan Management Company, a major Oakland landlord that through at least four LLCs has bought 284 houses and apartment buildings, mainly in West Oakland. First Republic Bank has also financed Waypoint Homes’ acquisition of foreclosed properties. Headquartered in Oakland, Waypoint is one of the giants of the foreclosure-to-rental industry. Furthermore, Thomas Barrack, Jr., the chairman and CEO of Colony Capital and Colony American Homes, is on First Republic Bank’s board of directors. Like Waypoint, Colony American Homes bought up thousands of single-family houses during the foreclosure crisis and rents them out. Companies such as Sullivan Management and Waypoint have been criticized by community organizations that allege they have elbowed low-income home buyers out of markets, among other harms.